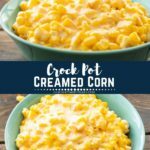 If you are hosting the holidays and running out of kitchen space this delicious Crock Pot Creamed Corn is the perfect solution! This creamy side dish is super easy and I love that it’s cooked in my slow cooker and doesn’t take up any oven space. 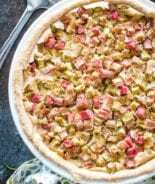 Plus, it has a secret ingredient. Cheese! Everything is always better with cheese. I’m always asked to bring this easy, classic creamed corn to the holidays. When holidays roll around how do you divide your time? We live close to both my husband’s and my families. Like as in about 15 minutes at the most to make it to either set of parents. This makes it interesting when trying to appease both sides of the family on holidays! We are very blessed, don’t get me wrong, but I feel bad saying that we can’t make it to either side of the family! I’ve decided that I’m to write down where we go each holiday and just rotate it. Then no one can say much right? Not that anyone ever has. Maybe I just have a guilty conscience. Do you know what else always makes it hard? When my Mom “mentions” she just might be making my favorite holiday dish EVER. Then I get all sad because let’s admit it I’m sorta into food if you haven’t noticed already. This certain dish is only served at holidays and it’s my favorite. 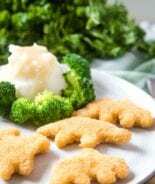 Like in the fact that my mouth is watering just envisioning it. 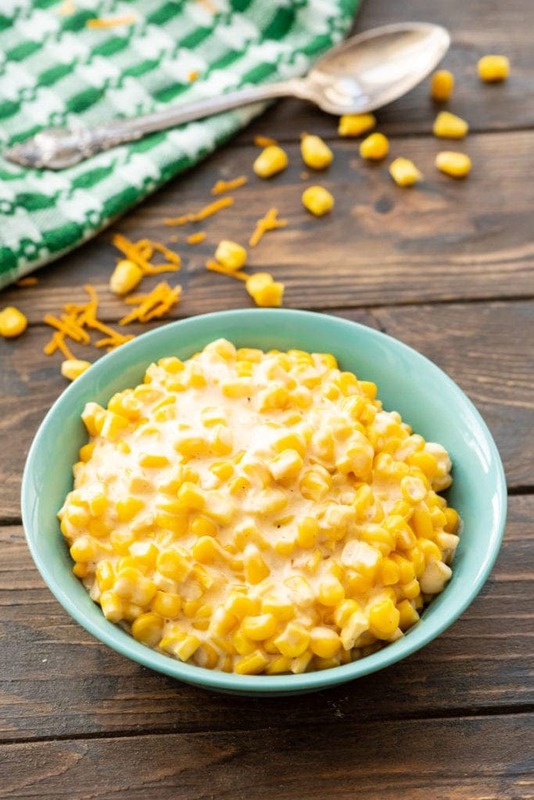 The dish I’ve become known for is this super easy Creamed Corn that’s made in the Crock Pot! 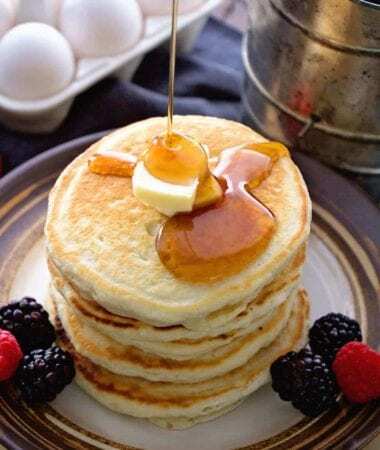 I love it because it’s ridiculously simple and all my guests love it too. 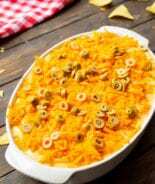 It’s becoming the “most request” holiday side dish in my recipe book. I mean I can see why. It’s good all the good stuff like whipping cream and cheese. 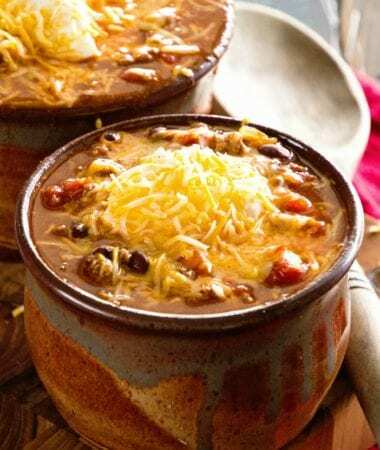 Plus, it’s made in your slow cooker so it’s pretty much hands off, easily transportable and you can make it ahead of time and just turn the crock pot on and let it cook. 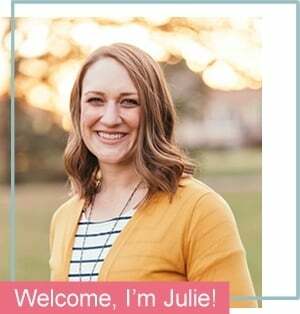 That is perfect for the holidays when you have last minute details to pull together if you are entertaining, or if you need to go to church and won’t be home and just because you like easy and simple. But, wait you don’t just need to save this for the holidays! 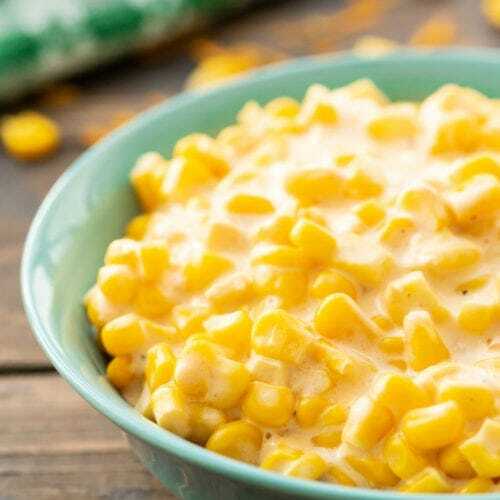 The nice thing about this creamed corn recipe it’s perfect all year long! Winter… with braised short ribs you bet! Grilling up some pork chops… THIS is the perfect side dish! 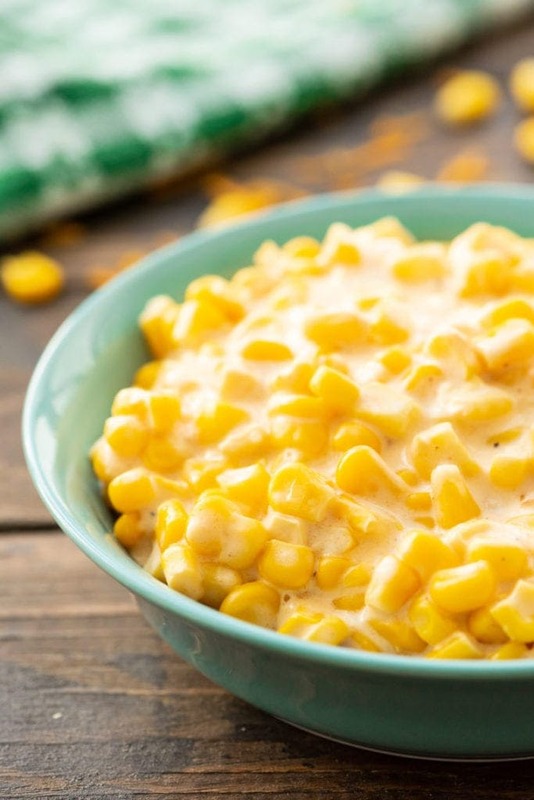 This is the BEST creamed corn recipe! No standing at the stove, stirring. One pot and easy to make! 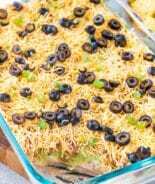 Crowd-friendly, everyone loves this dish, it’s perfect for dinner and great for a potluck! Plus, it only require six ingredients. I’m pretty sure EVERYONE can make this one. In fact, my bachelor brother in-law asked for the recipe and pulled it off! 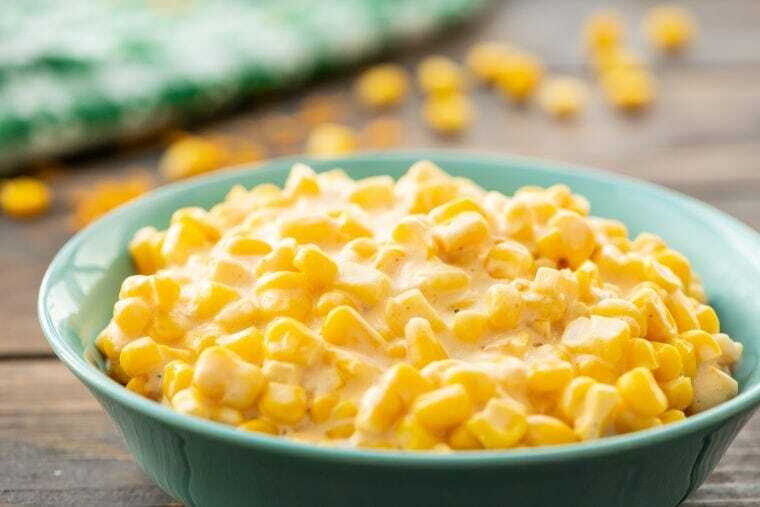 Let the slow cooker do all the work for you while you relax and enjoy a big bowl of creamy, dreamy, cheesy corn! Combine all of the ingredients in the slow cooker. Stir to combine. Cover and cook on low 3-4 hours or until warmed through and cheese is melted. Stir before serving. Which is your favorite side dish? Be sure to comment below, I definitely want to hear from you!!! 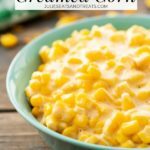 Classic creamed corn recipe this is made in your Slow Cooker! 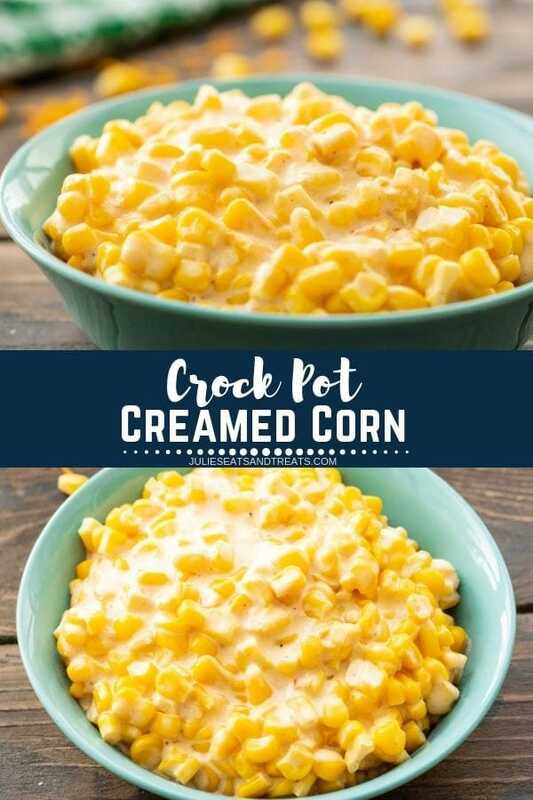 This Crock Pot Creamed Corn is such an easy side dish for the holidays! 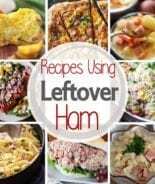 In a 4 qt slow cooker combine all ingredients. Stir to combine. Cook, covered, on low 3-4 hours or until warmed through and cheese is melted. Stir just before serving. The ingredients are listed but it doesn’t say how much of each item!